Guardian Pharmacy of Maine, formerly Waltz Long-Term Care, provides a full range of medical products and services to patients residing in nursing homes, assisted living communities and rehabilitation facilities. At Guardian Pharmacy of Maine, our business philosophy is to partner with you, to provide enhanced pharmacy care, to listen carefully to customer needs and to develop innovative and collaborative solutions. Mainecare is now paying for 90 day supplies for certain beneficiary’s maintenance medications. To find out if you, your loved one or the person you are caring for is affected by this change, please contact the beneficiary’s assigned caseworker and have them contact Mainecare directly with any questions. 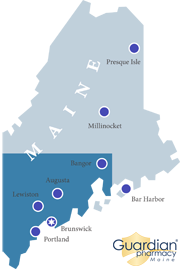 Contact information for Mainecare can be found by clicking here. If you have questions regarding what medications are classified as maintenance medications, please click the following links for important MaineCare information including the “MaineCare Preferred Drug List” known as the “PDL” as well as the Prior Authorization Process thought which overrides to the PDL can be requested. 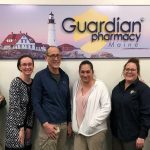 The team at Guardian Pharmacy of Maine would like to wish Norm Leblanc, our colleague of 12 years, the best of luck in his new role as IT Systems Support Coordinator for Guardian Support Services in Atlanta.